Hideaway protection from flying pests, midges and pollen. 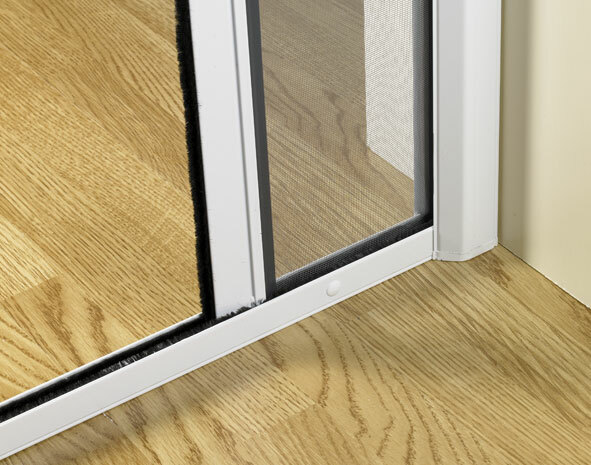 This discrete and effective roller fly screen for windows and doors is our all time best seller. Offering stylish protection from flying pests or pollen, it is easy to install and operate - hiding away when not in use. Easy to operate: Simply pull down when you open your window (or pull accross for door screens). A tilt of the bottom rail to release, and the insect screen will smoothly retract into its slim-line cassette. Available with a choice of mesh types (fly screen, midge mesh, pollen mesh and pet resistent fly screen mesh) and with either white or brown aluminium profiles. Suitable for the home, conservatory or business and is custom made to your measurements. Click below to buy online. Your screen will arrive with you ready to install. Why buy Our Roller Screens? 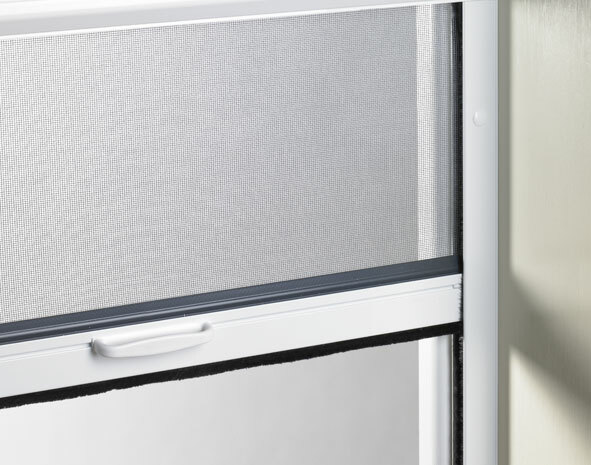 Slim-line Hide-away Screen: System 41 Roller Insect Screens comprise of a 41mm roller cassette containing roller tube, mesh and spring mechanism. The mesh is pulled over the window or door with colour coded handles. 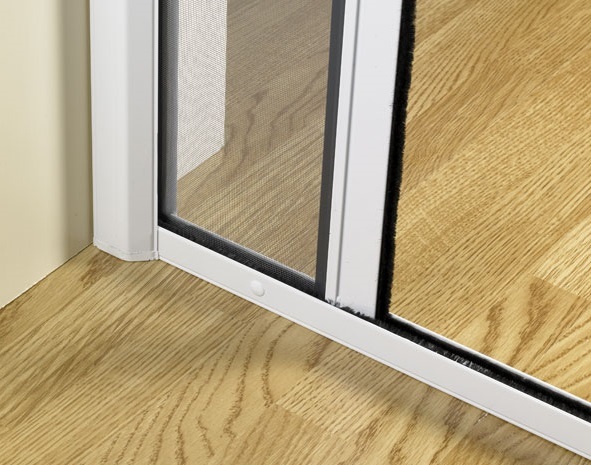 The mesh runs between 30mm x 22mm guide rails and either pulls closed to a window sill, or for opening lights without a sill or doors, pulls into a U-shaped magnetic closing profile. Beyond it's slim-line aesthetics, the beauty of the system is that when your door or window is not open, the screen simply retracts smoothly back into the cassette and you can forget about it. You don't need to take the screen down and store away outside of the summer season. Custom Made to Your Measurements & Specification: Unlike many low cost roller screen products, our screens are hand made in our UK based factory to the sizes that you enter and the specification that you select during purchase. Meaning that when you receive your screens they are ready to install, without any arkward trimming hassle. All of the hard work is done for you in our factory! Fly Screen mesh - standard gauge fibre glass mesh - keeps out flies, spiders, wasps, bees and most other insects. Midge Mesh - a finer gauge mesh which will additionally keep out small midges often found in the highlands of Scotland, and elsewhere. Pet Mesh - standard gauge, but hard wearing and "claw resistant". This mesh is ideal for those who want let fresh air inside on summer days and evenings but have exuberant pets who might otherwise tear standard mesh to shreds! Pollen Mesh - Our finest mesh, designed specifically for those suffering from pollen allergies, such as hayfever. Enjoy fresh air but keep pollen (and insects) out! Unique Brake System: Our screens are spring operated and free from operating chains, which can get tangled and pose a hazard to younger children. In addition, all of our screens feature a unique and 100% reliable brake system which slows down recoil of the screen. This prevents the screen clattering back into its cassette when released, eliminating the risk of damage to the product or worse still, harm to trapped or pinched fingers! String, Long Lasting Powder Coated Aluminium Profiles: Unlike other screens which use flimsy plastic or light weight metal profiles, our screens use rigid corrosion proof aluminium, protected with a strong powder coated finish, which is available in either White RAL 9010 or Brown RAL 8014. For special "project" requirements additional RAL colours are available and we can even powder coat to custom RAL colours. In the UK, as most windows open outwards, our screens are most often installed internally. However, they are designed to with stand the rigours of year long external installation. So you can be sure that both mesh and profile will not deteriorate for many years! The UKs Best Selling and Most Established Roller Screen: Our roller insect screen system has been on sale in the UK since 1994, exclusively. That's a track record of over 20 years, during which time it has been used in both the commercial and residential environment. Its proven quality, durability and sleek, discrete aesthetics have found our system installed as part of major long term contracts furnishing military accomodation for the UK Ministry of Defence and US Airforce. Suitable for business and food preparation areas: Our roller insect screens comply with all current and proposed European Community regulations - see regulation no. 93/43 EC on hygiene in foodstuff preparation. Convinced Yet? Have a look at our screens for windows, single doors, double doors and buy online with fast UK delivery!